Often it is said that the essence of successful angling is using the right tactics in the right place at the right time. Of course this is very true, yet regardless of how hard we anglers try to plan our trips, successfully combining all of these three ingredients to create the perfect days fishing can be frustratingly difficult, especially when the area you intend to fish is located halfway around the world. 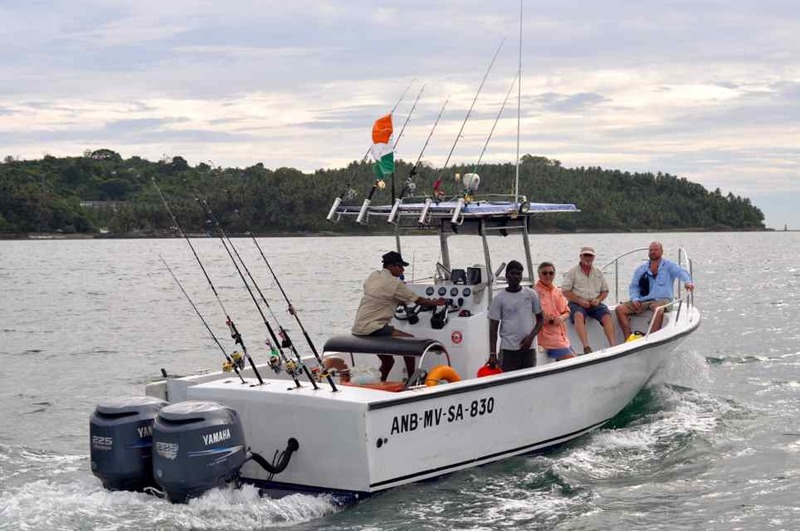 Thankfully, just occasionally, things do work out as planned, yet never in my wildest dreams did I imagine I would experience a day’s fishing surface poppers such as the first days fishing of my first trip to The Andaman and Nicobar Islands. Located in the Bay of Bengal a little closer to the coast of Thailand than the Indian sub-continent to whom The Andaman’s belong, until recently this chain of tropical islands was virtually unknown to sports fishermen. 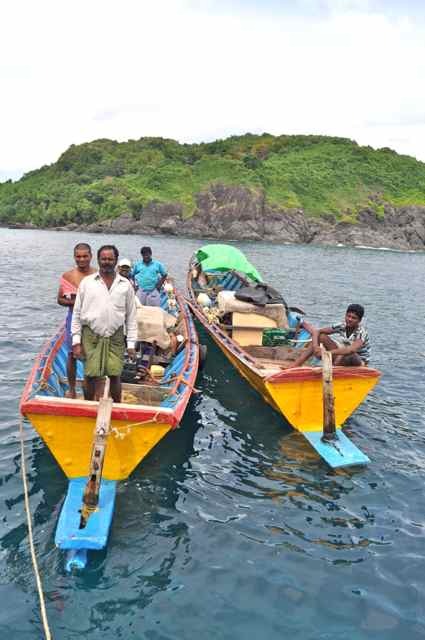 Today The Andaman Islands are one of the most talked about destinations among the growing numbers of fishermen who get their kicks from throwing industrial sized surface lures over coral reefs and blue water tide rips, or in rapidly cranking hi-tech speed jigs up out of the oceanic depths under the blistering heat of a tropical sun. 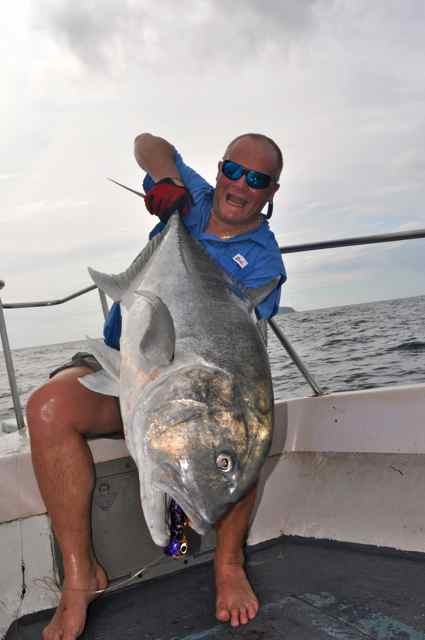 I had escorted a group of 10 clients and friends on a trip that from the initial planning stages had been centred around our mutual passion for catching big giant trevally, dogtooth tuna and the plethora of other species of super tough, super strong fish that are associated with the areas we tend to fish. 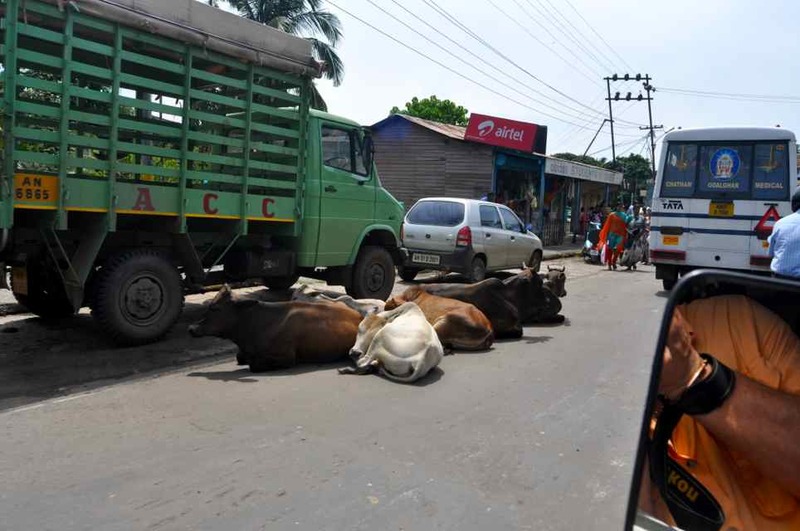 We were guests of ‘Game Fishing India’ who have their base in Port Blair, the bustling capital of The Andaman’s, a place where more likely than not the cause of the traffic jam you happen to be stuck in during the short trip to their guesthouse from the airport will be a cow or two sleeping in the middle of the road! Our initial plan was to spend a just few days based at Port Blair before moving on to Havelock Island, but the threat of an approaching cyclone unfortunately meant we were forced to spend a full week in the capital. I suppose the fairest way to describe Port Blair would be to say it is very much a ‘third world type of town’, run down, dirty, a dim shadow of what once it clearly was at its colonial peak. That said, the people we met here were all very friendly and most spoke good English, which always helps. If you are the kind of person who during your holidays likes to visit swanky restaurants, air conditioned shops and possibly take in a few historic sights or locally held art collections, then Port Blair is probably not for you. If, on the other hand, your idea of vacation heaven is struggling to stay on your feet while holding on to a savagely bent fishing rod that is attached to the most amazingly powerful fish, a fish that is doing its utmost to pull you out of the boat, then read on! For the first day of fishing on our ‘Andaman Islands Adventure’ I had teamed up with my life long angling friend Andrew Leaves. We decided the day would be devoted exclusively to our mutual passion of popper fishing. 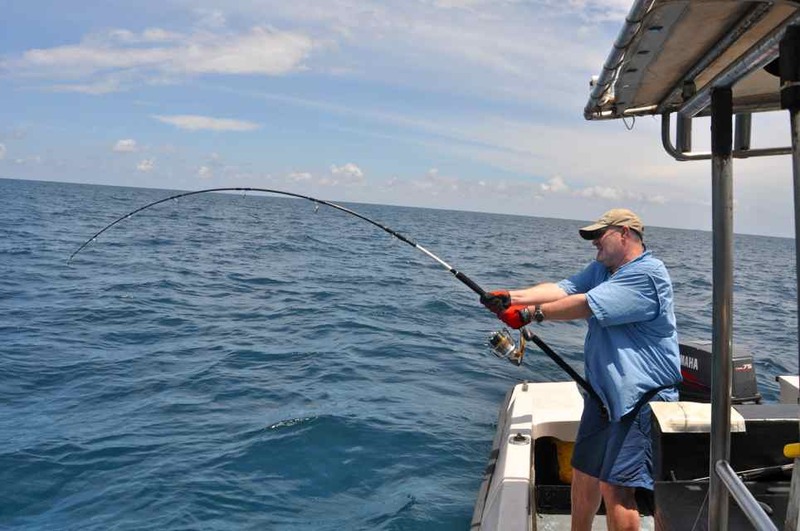 Others from our group elected to have a mixed days fishing, which likely would include some popper fishing along with jigging and the opportunity to soak live baits to catch the industrial sized dogtooth tuna, GT’s, grouper, snapper, shark and black marlin that hunt the drop offs offshore. The evening following that first days fishing everyone had their tail to tell, but I think that it is fair to say that on this occasion it was Andrew and I who had earned top bragging rights; here is our story. We had set off from our berth in the grubby, litter strewn harbour behind Chatham Wharf, and headed south to fish around a couple of small islands called ‘The Sisters’. We knew this was going to involve a run of a couple of hours and we had mused that there was nothing wrong with that, thinking that a brisk boat ride on a gorgeous tropical blue sea would be the perfect first day tonic to blow away the jet lag. The problem was the boat we were fishing aboard was without a doubt the most uncomfortable, wettest, back jarring piece of un-seaworthy moulded plastic I have ever had the misfortune to step aboard. Typically I carry I snorkel and mask when fishing in the tropics, intended for a refreshing lunchtime swim, on this trip I almost had to resort to wearing the snorkel while underway in order to breathe, such was the volume of water getting thrown over the bow. Just for the record, that boat has now been sold, and its replacement along with Game Fishing India’s other boats are all superb, spacious, seaworthy and stable. Not surprisingly when we arrived at The Sisters it took a while to re-group and get ourselves organised before we were ready to start fishing. The first mark we fished appeared on the LCD screen of the boats sounder as a series of shallow ridges located 60ft below the surface and the trick, we were told, was to use big poppers. We would need to use those with a deep concave face that really ‘Bloop!’ their way across the top, lures that make as much commotion as possible in order to advertise their presence and draw fish up from the bottom. Our guide had advised us it would take two or three drifts across a deep mark such as this in order to wake the fish up before any serious action would start. Well we made those first two or three drifts, then two or three more, and with no visible sign of any feeding activity we moved a short distance to another area, which was located in much shallower water just off the beach of the larger of The Sisters; and this is where the story really begins. I can’t remember exactly who hooked the first fish but I think it was Andrew, as I was still struggling to empty water from both my lungs and my camera bag. From the very first drift we made over that mark pretty much each and every cast would result in either a following fish or more likely than not an explosive strike and a bent rod. We had arrived, we quickly discovered, in ‘GT Heaven’, and not only that but we had arrived on a day when the fish were feeding, and feeding as if they thought they were not expecting to see another meal for a month. There were GT’s everywhere we cast. Often as many as a dozen or more aggressive fish would rush at a lure then follow the one that ultimately was hooked right to the boat, occasionally we saw aggressive following fish actually trying to steal a popper right out of the mouth of a fish that already was hooked. It was a surreal sight, and had we not left our 12wt’s back at the guesthouse this would have been the day to throw flies at GT’s. Mostly those GT’s we caught were small to medium sized fish of between 15-30lb, but as the hours passed we started to hook a few better ones. The biggest fish of the day we caught were certainly well in excess of 60, possibly 70lb. In order to increase our chances of hooking bigger fish we found we had to move away from the area of greatest activity, but invariably no sooner had we started working our poppers over a new patch of water when the main feeding hordes would once again rush them. So how many GT’s did we catch? Well our total for the day, which excluding travelling time and lunch was really only about four hours fishing, was a staggering 41 GT’s plus one dogtooth tuna released. An impressive tally but not quite Game Fishing India’s record, that, we were told, was 44 GT’s in one day! Local fishermen join us for lunch at ‘The Sisters’. The fish curry they shared with us was amazing! Truly we had experienced a days popper fishing the likes of which we will be very lucky to experience ever again, but we paid for it! The following day Andrew failed to get up and go fishing, and I confess it was nothing short of a monumental effort for me to leave the guesthouse and walk down to the dock, though if I am absolutely honest that’s got more to do with the previous evenings celebrations rather than muscle fatigue! For the rest of our week we enjoyed what normally would be rated as excellent fishing, yet Andrew and I found somewhat mediocre after such an incredible start. On every day we fished we caught good numbers of GT’s, along with some nice dogtooth tuna, green job fish and many other species. Unfortunately and just as forecast, towards the end of our week the weather deteriorated as the deepening cyclone approached, severely restricting where we could fish. The decision not to relocate to Havelock had been a good one. 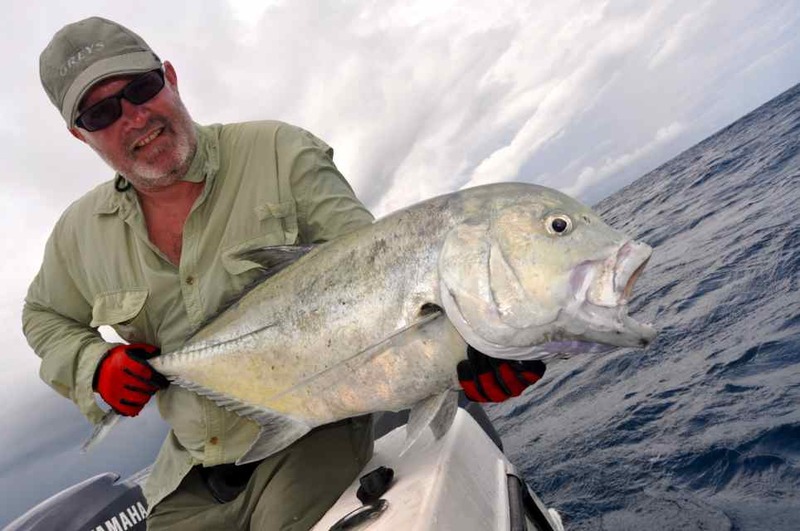 Among the ever growing numbers of travelling anglers, giant trevally are now regarded as something of a cult species, so much so that for the past ten years around half of the many trips I have hosted abroad have focused almost exclusively on catching this magnificent fish. 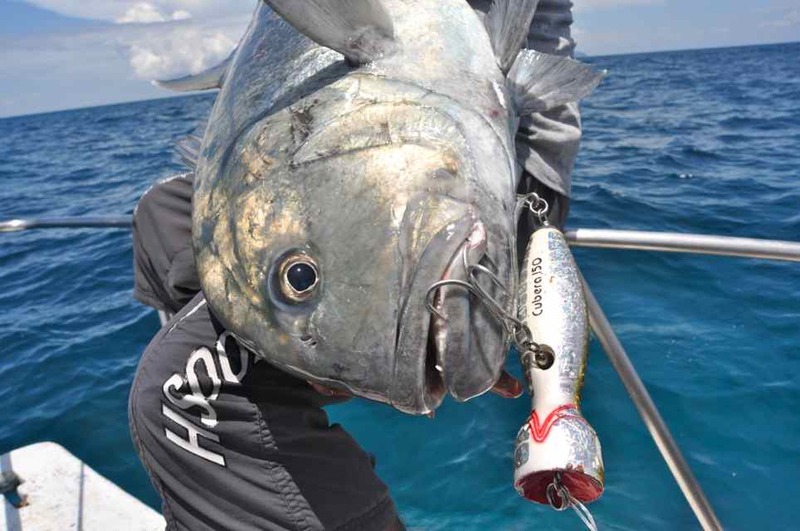 As more and more anglers travel exclusively to target GT’s, now would be a good time to take a closer look at this spectacular species of fish, along with the tackle you will require to catch these ‘bull dogs of the reef’. Widely distributed throughout the Indo-Pacific region, GT’s are mostly found in relatively shallow water and almost always in close proximity to the coral reefs and drop offs where they hunt. Typically the fish average between 10-50lb, but each and every cast you make over suitable ground while fishing in GT territory has the possibility of hooking a 100lb monster. 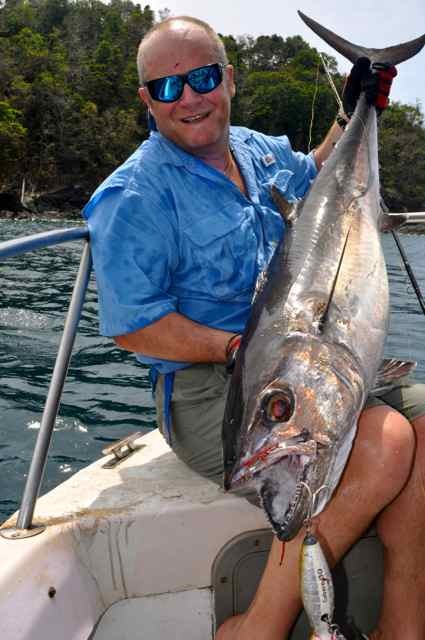 The IGFA all tackle record in 2012 stood at 160lb 7oz. That it is only in relatively recent years that GT’s have become so popular is really no great surprise. It wasn’t until the introduction of the high quality tackle we use to catch them today that it has been at all possible to catch this species of fish on anything like a regular basis. 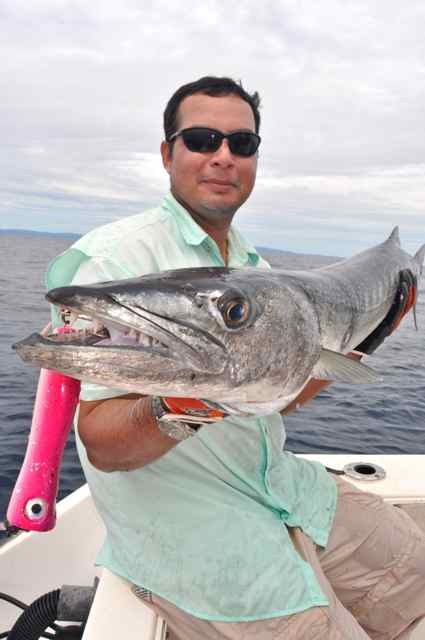 You can catch GT’s using pretty most methods including trolling and drifting with live baits, which once were the techniques that caught most fish. Today’s anglers when fishing specifically for GT’s typically use either surface poppers or speed jigs. Modern braided lines are essential, with 80lbBS braid being considered as ‘light’ line by some GT fanatics who routinely use main lines with a breaking strains considerably excess of 100lb. Popping and jigging rods are highly specialised, they are incredibly strong and built for the task, they have to be, else they will soon shatter under the immense pressures that they will be subjected to during the fight from even a modest GT. 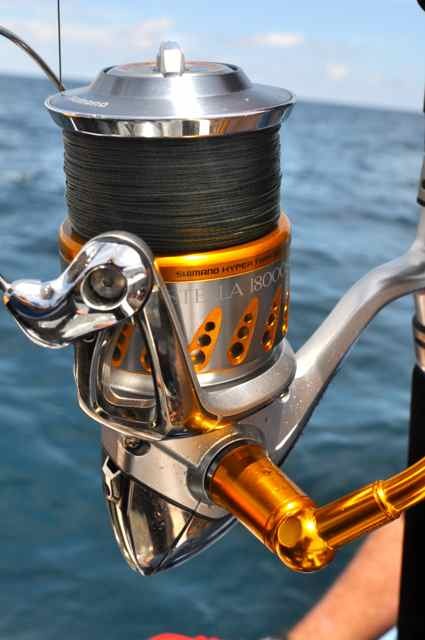 Reels must be similarly robust, indeed this is one form of fishing where there really are positive benefits in buying the most expensive tackle available. You will be paying for a reel that is built to the highest technical specifications, a reel that can apply upwards of 30lb of drag pressure; such high drag settings are necessary to subdue even a modest GT. Often I have had clients join me on trips having naively bought inferior reels; and invariably these reels fail, usually in quite dramatic style, the moment they are put to the test. Aside from the fact that GT’s are an immensely powerful fish, the fact that almost always they are located and hooked near some form of structure means that from initial hook up they must be fought as hard as possible. Prior to the availability of good quality braided lines, the monofilament lines generally used by lure fishermen had too much inherent stretch to ever be able to stop a fish from getting into structure, and this is in part why the species has only recently become so popular with anglers. Before the availability of braided lines and really robust terminal tackle such as Owner ST-76TN5X hooks, GT’s in most areas where they were hooked were virtually uncatchable. The various seasons and their associated monsoon and cyclone periods at various locations throughout the tropics are complex, and it is difficult to accurately predict the optimum times of year to fish at many destinations. Typically I have found the most stable weather throughout the tropics is found during the driest seasons in those areas where the fish are caught. 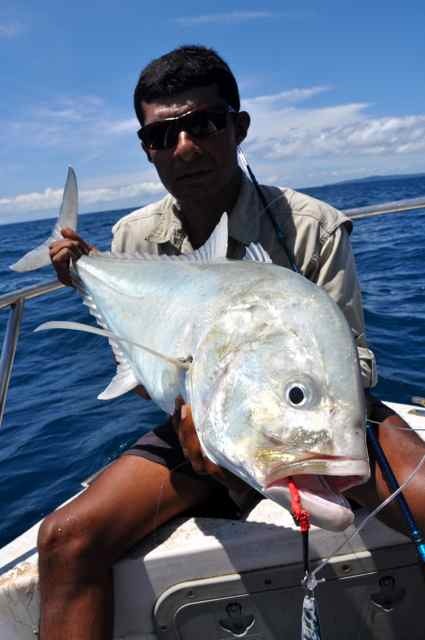 That said, often the giant trevally fishing will be at it’s best when the temperatures increase towards their annual maximum, but you do need to try to avoid the strong winds that are often associated with hot late summer monsoons and cyclones. Always when fishing the tropics you should expect to encounter wind, but there is a significant difference between a consistent 15-20 knot trade wind, and the constantly alternating winds generated by intense low pressure systems resulting from either monsoons or cyclones. Consequently whenever researching to fish at any venue located within the tropics, but specifically the more remote and inaccessible venues, always fully look for the optimum times to fish, which may well be a limited window of opportunity of just two or three months. I am an avid fisherman, fished in many places in the world. Just love the Andamans, will be putting up a retirement home here. Get in touch with me on adprba@gmail.com for some very exciting adventure holidays. Thanks for getting in touch. let me know how your plans go in The andaman’s, I might call in one day! Can you email me prices for the Anderman island GT fishing.